Nicole Vincent is one the best contemporary philosophers of responsibility. Her work deals with the intersection between neuroscience, criminal law, and theories of responsibility. As it happens, I originally intended to focus my research on these intersections too. Although my research focus has changed somewhat, I still try to read Vincent’s work regularly and when I do I’m always impressed by its content. In this post, I want to share what I think is (to date) Vincent’s most significant contribution to the philosophy of responsibility: her structured taxonomy of responsibility concepts. In the first instance, this taxonomy attempts to distinguish between the various responsibility concepts that permeate the literature on this topic. Many authors have attempted similar conceptual breakdowns in the past. What makes Vincent’s attempt more interesting is that she goes on to identify the potential links (entailment relations etc.) between these responsibility concepts. I think this is a valuable exercise and hopefully you’ll think the same once you’ve read this post. I’ve broken this post down into three main parts. The first part describes the six responsibility concepts identified by Vincent. The second part looks at Vincent’s proposed structural relationships between these concepts. And the third part considers the all-important role of norm-setting in theories of responsibility. For those who are interested, the article on which I’m basing this post can be found here. It’s long been recognised that the term “responsibility” is deployed in ordinary speech to cover a diverse set of concepts. For example, the famous legal philosopher HLA Hart once told a story about a reckless and incompetent ship’s captain whose ship was sunk. In the story, the word “responsibility” was used to describe the cause of the event, the captain’s incompetence, the captain’s duties and the captain’s liability. This level of conceptual ambiguity is unappealing. Virtue-Responsibility: This covers descriptions of a person as being diligent, dutiful and so forth. In other words, it covers the idea of the “responsible person”, the one who has the virtuous character traits we would expect of a responsible agent. Role-Responsibility: This covers the duties which are attached to a person in virtue of their institutional, social or moral position. In other words, it covers a person’s responsibilities: the things they are expected to do and which they are subjected to moral criticism if they fail to do. For instance, a ship’s captain is responsible for the well-being of his crew and the safety of his vessel. Outcome-Responsibility: This covers the outcomes (events or states of affairs) for which a person is held responsible. For example, a murderer is held responsible for a murder; and a ship’s captain is held responsible for the sinking of his vessel. Causal-Responsibility: This covers the causal links between events and states of affairs. For example, a storm might be responsible for a flood; a drought might be responsible for a famine; and so forth. In some ways, the causal sense of responsibility might be deemed metaphorical or analogical as opposed to real. But, as we shall see, causal judgments do play a crucial role in determining when and where our other responsibility concepts apply — so it’s not right to exclude it from a taxonomy of responsibility concepts. Capacity-Responsibility: This covers the capacities (distinct from character traits) that an agent needs in order to be deemed responsible. For example, it has often been held that an agent needs a capacity for rational thought, for choice, and for voluntary decision-making in order to be responsible. The precise mix of capacities needed is not important here, all that matters is the general idea that certain capacities are needed. Liability-Responsibility: This covers the punishments, sanctions or, more generally, the burdens that will apply to the responsible agent. For example, a person who is responsible for committing a crime, may be liable to spend some time in jail; or an employer who wrongfully dimisses an employee may be liable to pay damages to the employee. These six responsibility concepts capture the key aspects of what we might call the responsibility ecosystem, i.e. the environment in which judgments about responsibility are actually made. Although we may have a desire to single out one of these concepts (e.g. outcome-responsibility) as being the “true” or “paradigmatic” sense of responsibility, Vincent suggests that there is little rationale for doing so. Each has an important part to play. As I said at the outset, performing a conceptual breakdown on the idea of responsibility is nothing new, and while Vincent’s conceptual breakdown is perhaps more complete than others I have seen, her main contribution comes in her attempt to identify the structural relationships between each of the six concepts. By identifying these relationships, Vincent hopes to show how judgments about one kind of responsibility (e.g. role-responsibility) might shape or influence judgments about another kind of responsibility. The following diagram captures the broad outlines of Vincent’s model of these structural relationships. 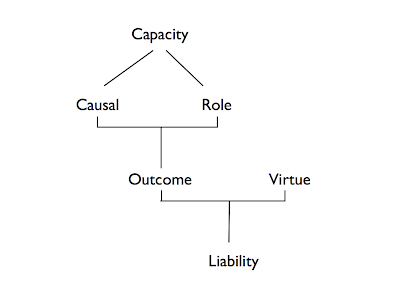 Here, roughly, is how the diagram is to be read: judgments about capacity-responsibility influence judgments about causal and role-responsibility; judgments about outcome-responsibility are derived from judgments about causal and role-responsibility; and judgments about liability-responsibility are derived from judgments about outcome and virtue-responsibility. Vincent goes through these structural relationships in more detail in her article. Interestingly, she starts in the middle by looking at how outcome-responsibility depends on causal and role responsibility. From there, she works her way back to capacity-responsibility, before finally moving on to consider liability-responsibility. What follows is an abbreviated summary of what she has to say. I. Outcome-Responsibility comes from Causal and Role-Responsibility: When we come across an event or state of affairs that seems morally troubling to us, we typically ask “who’s responsible?”, i.e.”who is responsibility for this outcome?”. In answering this question, we first try to trace the event or state of affairs to the actions of an agent or group of agents. This tracing exercise involves an assessment of causal responsibility. But causal responsibility is never enough for outcome responsibility. Why not? Because outcomes are typically the result of many causes and to single one out for particular attention is questionable unless you have some good reason for doing so. This is where role-responsibility becomes important: it determines the duties that apply to agents and makes it legitimate to single ascribe outcome responsibility to them. II. 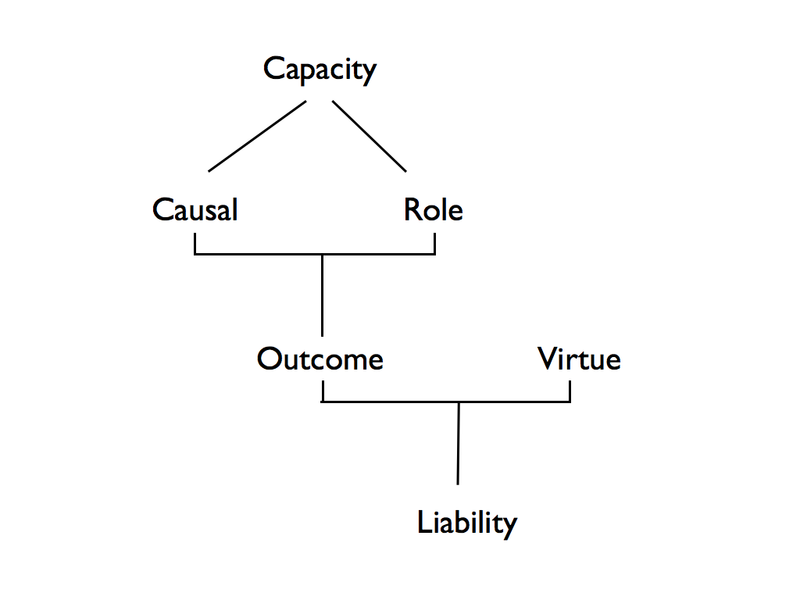 Capacity Responsibility Shapes Causal and Role-Responsibility: An agent’s capacities determine what it is possible for them to do. As a result, responsibility concepts tend to track capacity. This happens in positive and negative ways. In the positive way, capacities tell us what kinds of roles it is appropriate for an agent to fulfill. In the negative way, a lack of capacity provides excuses for an agent. In particular, an incapacity can make it illegitimate to causally attribute an action to an agent. III. Liability Responsibility comes from Outcome and Virtue Responsibility: Liability responsibility is, as noted above, concerned with the burdens and sanctions that it is fair to impose upon an agent. Vincent argues that the process of deciding whether and how much of a burden to impose on an agent is guided by outcome and virtue responsibility. Outcome responsibility might act as a necessary, but perhaps not sufficient, condition for liability responsibility. And then an agent’s virtue (i.e. how good or bad a person they are) determines how much of burden to impose on that agent. Although the three structural relationships identified by Vincent are plausible, I can’t help but wonder whether other structural relationships are possible. Norm-setting plays an important role in determining the scope and applicability of the responsibility concepts outlined above. In this instance, norm setting is, unsurprisingly, the process of establishing some standard or ideal. The failure to obtain this standard opens one up to the possibility of moral criticism. Norm-setting often allows for some leeway, but it must be guided by moral considerations. Vincent identifies three areas in which norm-setting plays a part in her structured taxonomy. The first is in relation to capacities - deciding which capacities impose duties upon an agent and which incapacities provide excuses is, in essence, a norm-setting task. The second is in relation to role responsibility - deciding which duties it is appropriate to impose on agent (depending on their social or institutional context) is a norm-setting task. Finally, the third is in relation to liability - deciding which kinds of burdens to impose upon an agent, as well as the extent of those burdens, is also a norm-setting task. This brings us to end of this post. As we have seen, Vincent has broken responsibility down into six component concepts. She has also attempted to map the structural relations between these concepts and to identify the role that norm-setting plays in determining the applicability of those concepts. One may ask: what’s the use of all this? Vincent actually spends a long time trying to answer this question in her article (link is above), but the answer is relatively straightforward: it allows us to bring clarity to otherwise uncertain debates about “responsibility”, it shows the different kinds of question we can ask about an agent’s responsibility, and it gives us the outline of a process for resolving disputes about responsibility. For more on each of these, you’ll have to read the article.